A Forest Garden is a designed agronomic system based on trees, shrubs and perennial plants. These are mixed in such a way as to mimic the structure of a natural forest – the most stable and sustainable type of ecosystem in this climate. 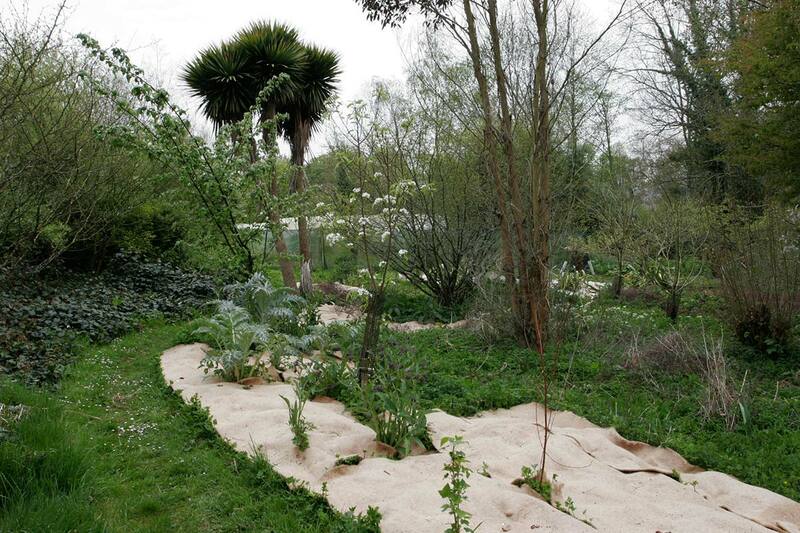 Martin Crawford has written a comprehensive design manual for creating a forest garden. Check it our by clicking here! The crops which are produced will often include fruits, nuts, edible leaves, spices, medicinal plant products, poles, fibres for tying, basketry materials, honey, fuelwood, fodder, mulches, game, sap products. Forest gardens (often called home gardens) have been used for millennia in tropical regions, where they still often form a major part of the food producing systems which people rely on, even if they work elsewhere for much of the time. They may also provide useful sources of extra income. They are usually small in area, often 0.1-1 hectares (0.25-2.5 acres). In temperate regions, forest gardens are a more recent innovation, over the last 30 years. A major limiting factor for temperate forest gardens in the amount of sunlight available to the lower layers of the garden: in tropical regions, the strong light conditions allow even understorey layers to receive substantial light, whereas in temperate regions this is not usually the case. To compensate for this, understorey layers in temperate forest gardens must be chosen very carefully. There are plenty of plant crops which tolerate shady conditions, but many are not well known. Many of the more common shrub or perennial crops need bright conditions, and it may be necessary to design in more open clearings or glades for such species. Temperate forest gardens are also usually small in area, from tiny back garden areas up to a hectare (2.5 acres) in size. The large number of species used, giving great diversity. The careful inclusion of plants which increase fertility, such as nitrogen fixers (eg. Alders [Alnus spp], Broom [Cytisus scoparius], Elaeagnus spp, and shrub lupins [Lupinus arboreus]). The use of dynamic accumulators – deep rooting plants which can tap mineral sources deep in the subsoil and raise them into the topsoil layer where they become available to other plants, eg. Coltsfoot [Petasites spp], Comfreys [Symphytum spp], Liquorice [Glycyrrhiza spp], Sorrel (and docks!) [Rumex spp]. The use of plants specially chosen for their ability to attract predators of common pests, eg umbellifers like tansy. The use, where possible, of pest and disease resistant varieties, eg. apples. The increasing role of tree cover and leaf litter which improve nutrient cycling and drought resistance. There is an excellent free app called Ticl (smart phone and web based) which allows you to walk around a garden with a smart phone and it will describe the plants nearest to you – or you can locate specific plants using a direction-finder. Online you can see a zoom-able map of the garden with location points marked on. If you visit the garden with a smart phone you can use Ticl to help identify what is growing! Click here to see the ART forest garden. You need to log in to see all the plant points. – the highest layer of trees. May include species such as Chestnuts [Castanea spp], Persimmons [Diospyros virginiana], honey locusts [Gleditsia triacanthos], Strawberry trees [Arbutus spp], Siberian pea trees [Caragana arborescens] Cornelian cherries [Cornus mas], Azeroles and other hawthorn family fruits [Crataegus spp], Quinces [Cydonia oblonga], Apples [Malus spp], Medlars [Mespilus germanica], Mulberries [Morus spp], Plums [Prunus domestica], Pears [Pyrus communis], highbush cranberries [Viburnum trilobum]. – mostly planted between and below the canopy trees. May includes some of the canopy species on dwarfing rootstocks, and others such as various bamboos, Serviceberries [Amelanchier spp], Plum yews [Cephalotaxus spp], Chinkapins [Castanea pumila], Elaeagnus spp, and Japanese peppers [Zanthoxylum spp]. Others may be trees which will be coppiced to keep them shrubby, like medicinal Eucalyptus spp, and beech [Fagus sylvatica] and limes [Tilia spp] with edible leaves. – mostly quite shade tolerant. May include common species like currants [Ribes spp] and berries [Rubus spp], plus others like chokeberries [Aronia spp], barberries [Berberis spp], Chinese dogwood [Cornus kousa chinensis], Oregon grapes [Mahonia spp], New Zealand flax [Phormium tenax] and Japanese bitter oranges [Poncirus trifoliata]. – several of which are herbs and will also contribute to the ground cover layer by self-seeding or spreading. These may include Bellflowers with edible leaves [Campanula spp], Comfreys [Symphytum spp], Balm [Melissa officinalis], Mints [Mentha spp], Sage [Salvia officinalis], and Tansy [Tanacetum vulgare]. – mostly creeping carpeting plants which will form a living mulch for the ‘forest floor’. Some may be herbaceous perennials (see above), others include wild gingers [Asarum spp], cornels [Cornus canadensis], Gaultheria spp, and carpeting brambles (eg. Rubus calycinoides & R.tricolor). – These are generally late additions to the garden, since they obviously need sturdy trees to climb up. They may include hardy kiwis [Actinidia spp], and grapes [Vitis spp]. – Any design should take account of different rooting habits and requirements of different species, even if root crops are not grown much. Some perennials with useful roots include liquorice [Glycyrrhiza spp] and the barberries [Berberis spp] whose roots furnish a good dye and medicinal products. Various beneficial fungi can also be introduced into this layer. A long-term biologically sustainable system for growing food & other products for a household, school, community group etc. Once established, little work is needed to maintain. Planting out and establishment usually requires large numbers of plants and substantial work.